These questions and answers were created by the STEMG to assist you in understanding the concepts of ASD Simplified Technical English (STE). Please contact the STEMG for any further information you may require. · What is ASD Simplified Technical English (STE)? · What is the AeroSpace and Defence Industries Association of Europe (ASD)? · Who created STE? And why? · Why does any industry need STE? · Who needs to write in STE? · How can I get a copy of the specification? · How is the STE specification maintained? · When will the next issue of specification be published? · Who do I complain to about STE? · How can I make suggestions to improve STE? · Why does STE not allow “-ing” forms? · Do conditional clauses always need to precede the main clause? · Why can’t I use passive sentences in procedures? · Why can’t I change the language in warnings and cautions. How do I make them compliant with STE? · Does the STE Dictionary include all the words that are necessary to write technical documentation? · If I submit a Change request (change form) for a new word or meaning, can I use it immediately? · How were the words for the STE dictionary chosen? · Can technical names and technical verbs contain vocabulary that is explicitly unapproved in the STE dictionary section? · Is a checker or a software product necessary to write in STE? · Where can I get STE training? · How is STE related to U.S. reading grade levels? · Is STE simple to write? · Is STE “baby English”? · Is STE just for non-native speakers of English? · Does STE eliminate the need for translation? · If translation is necessary, does STE help the translation process? · Will STE change the meaning of technical texts? · Can government employees use STE? · Can I speak STE? · Do readers need training for STE? · Can STE be used to teach English? · Can STE be applied to documents other than maintenance documents? 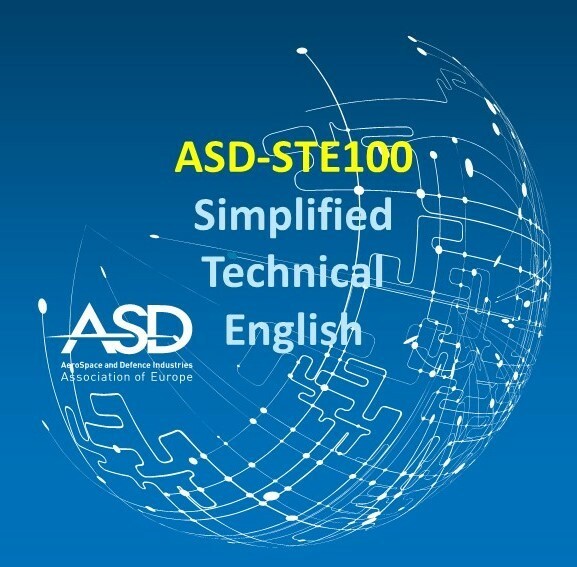 ASD Simplified Technical English (STE) is an international specification for the preparation of technical documentation in a controlled language. STE has two parts: a set of writing rules (part 1) and a controlled dictionary (part 2). The writing rules cover aspects of grammar and style. The dictionary gives the general words that a writer can use. STE has a controlled general dictionary that gives the words that are most frequently used in technical writing. The approved words were selected because they were simple and easy to recognize. In general, each word has only one meaning and functions as only one part of speech. For example, “to fall” has the approved meaning of “to move down by the force of gravity,” and not “to decrease”. When there are several words in English for the same thing (synonyms), STE permits one of these synonyms to the exclusion of the others. For example, STE uses “start” instead of “begin”, “commence”, “initiate”, or “originate”. STE approved meanings and spelling are based on American English (Merriam-Webster’s dictionary). In addition to its general dictionary, STE permits the use of company-specific or project-oriented technical words (referred to in STE as technical names and technical verbs). These words are related to the categories listed in the respective rules. Basically, writers can use the approved words in the dictionary as a core vocabulary. But they can also use terms that are usual in their companies or industries and applicable to their projects and products. The AeroSpace and Defence Industries Association of Europe (ASD) is the voice of European Aeronautics, Space, Defence and Security industries, actively supporting the competitive development of the sector. ASD (formerly AECMA) is the owner of the ASD-STE100 specification. For more information, please visit www.asd-europe.org. Who created STE? And why? The STE project was started in 1979. At that time, there were far more aircraft manufacturers than there are today, and, although they all wrote in English to the same ATA Specification (known as ATA 100), their writing styles were very different. There was documentation written in American English (Boeing, Douglas, Lockheed…), in British English (Hawker Siddeley, British Aircraft Corporation, …) and by companies whose native language was not English (Fokker, Aeritalia, Aerospatiale, and some of the companies that formed Airbus at the time). On top of that, some European airlines had to translate parts of their maintenance documentation into their local language for their mechanics to be able to understand it. This was a source of problems for the European airline industry and led them to approach AECMA in 1979, to ask the manufacturers to investigate the possibility of using a controlled form of English – and of course, of all manufacturers using the same! After investigation into types of controlled languages that existed in other industries, AECMA decided to produce its own controlled English, and in 1983, set up a project group, under the leadership of Fokker. The project was not limited to European industry, though. The American aerospace industry, through the AIA (Aerospace Industries Association of America) was invited to participate, especially as some AIA companies had already done some standardization along the same lines. The result of this collaborative work was a guide, known as the AECMA Simplified English Guide. This guide is now a Specification and in 2004, after the merger of AECMA with two other associations to form ASD, changed its name to become ASD Simplified Technical English, Specification ASD-STE100. In 2006, the Specification got the European Union Trade Mark. Why does any industry need STE? STE addresses difficulties in English comprehension related to complex sentence structures, confusing word forms, and ambiguous vocabulary. STE was created for the aerospace industry, but its benefits are indeed applicable to all industries. For example, it can be used for land and sea vehicles, as detailed in S1000D Specification. Who needs to write in STE? STE was developed to make maintenance documentation easier to read, so authors of such documentation use it when they write these procedures. It is not a language that you can use for “general” writing, for example international correspondence. However, its basic principles (for example, short sentences, one topic per sentence, active voice etc., can be easily adopted. How can I get a copy of specification? The specification is available to everybody at no cost. Please refer to the instructions give in the DOWNLOADS section. How is the specification maintained? The STE specification is maintained by the ASD Simplified Technical English Maintenance Group (STEMG) which consists of representatives from ASD member countries and non-ASD member countries. In addition, there are associate members representing the STE users (Airlines and Military Organizations). When will the next issue of Specification be published? The frequency of issues is usually three or four years. The current issue is 7 released in January 2017. The next issue is planned for 2021. How can I make suggestions to improve STE? The STE specification needs feedback from its users if it is to continue to improve. Send your queries to the STEMG. If you have a STE national representative in your country, send the queries directly to him/her. If there is no representative, address the queries to the STEMG Chairman or write to stemg@asd-ste100.org. There is a change form in the specification and in this web site. Use it to write your recommendation or change proposals. You may send the change form to the STE National Representative in your Country or at stemg@asd-ste100.org. The STEMG has records of all change forms produced and their assessments. The change forms are discussed within the STEMG and the agreed changes are included in the next issue of the specification. The originators of the change forms are usually notified of the related STEMG assessments and decisions. If I submit a change proposal (change form) for a new word or meaning, can I use it immediately? No. The STEMG will review the request, and changes will occur in a future issue of the specification if the request is approved. Why does STE not allow “ing” forms? One of the purposes of STE is to avoid ambiguity, and the use of words with an “ing” ending can easily lead to misunderstandings. “Ing” ending words can have different parts of speech, and can also be used in verbal constructions difficult to understand by non-native readers with a basic English knowledge. Moreover, verbal tenses with “ing” forms imply a duration that is not always clearly expressed. Since maintenance documentation requires clarity, precision and unambiguity, it has been decided to avoid these “ing” forms. There are words with “ing” endings in the dictionary, but these are always nouns, adjectives and prepositions. Examples, "opening (n)", "remaining (adj)", "during (pre)". Do conditional clauses always need to precede the main clause? No. This is not always the case, but if you give a condition in a work step that the operator must know before he does the work step, it is often more logical (and safer) to put this condition at the beginning of the sentence. Here, in the example, ” If hot oil touches your skin, it can cause burns.” It is more logical to write the condition first and then the result that follows from that condition. Why can’t I use passive sentences in procedures? When we write procedures, we use the kind of language that we would use if we were standing next to the mechanic doing the job. So we mostly use the imperative (or command) form of the verb and write, for example, “Install the component”. If we write “The component must be installed.”, this is not a direct instruction to the mechanic and ambiguity could occur. Procedures must be as direct as possible, not narrative as passive text. In descriptive texts, we can use the active voce as much as possible (i.e. “A” does “B”) and we can use the passive voice when it is absolutely necessary (for example, when we are describing an item that during its operation “receives” the action of another item (i.e. “B” is done by “A”)). Why can’t I change the language in warnings and cautions. How do I make them compliant with STE? In some companies, legal departments control the content of warnings and cautions. This is because of perceived liability issues. Technical staff can often work with lawyers to develop language that reduces liability risks and complies with STE requirements. Individual company policy will determine the extent to which this is possible. Does the STE dictionary include all the words that are necessary to write technical documentation? The STE dictionary has a controlled general vocabulary with sufficient words to write any technical sentence. The dictionary does not include technical names and technical verbs which are applicable to specific projects or industry. We use the STE dictionary words for basic sentence structure, but we must refer to the writing rules for the recommendations about the technical names and technical verbs and their categories. How were the words for the STE dictionary chosen? The criteria used to choose the approved words in the dictionary (the general words) were basically simplicity, flexibility and frequency of use. For example, “do” is simpler, more flexible and much more frequent than “achieve”, “carry out”, or “accomplish”. In most cases, the general words that are approved have only one approved meaning and one part of speech. For example “about” is only approved with the meaning “Concerned with”. You cannot use it to mean “approximately” or “around” (these words are themselves approved and defined). “Check” is only approved as a noun (as in “do a check”), not as a verb (as in “check the lights”). Can technical names and technical verbs contain vocabulary that is explicitly unapproved in the dictionary? Yes. Technical names and technical verbs are not listed in the Dictionary. They are defined in the specification by the categories they belong to. If an unapproved word in the dictionary is used with a technical name or technical verb to complete it, it automatically becomes part of that technical name or technical verb, and as such acceptable. This is the only way to use these unapproved words, but it is advisable to limit this use as much as possible. Is a checker or a software product necessary to write in STE? No. There are commercial companies who sell software products (such as grammar checkers, etc.) that support STE. STE users are free to use these products bearing in mind that they cannot replace the specification. ASD, the STEMG, their representatives and companies they belong to DO NOT endorse or certify “commercial companies” or providers that sell their software products which they declare to be ASD-STE100″fully compliant”. These commercial companies or providers have not received any authorization to use the ASD logo, copyright or trademark of ASD-STE100 in their material. Where can I get STE training? The members of the STEMG are authorized to give certified STE training. ASD and UNINETTUNO University have an agreement which permits UNINETTUNO to provide certified STE training online. UNINETTUNO offers certified STE training online. For more information, please contact the STEMG or UNINETTINO. How is STE related to U.S. reading grade levels? STE simplifies language with words that have restricted definitions and simpler sentence structures. When this is done, the resulting language is simpler and easier for readers of lower reading grade levels to comprehend, but STE does not guarantee compliance with reading grade levels. Is STE simple to write? STE was created for the maximum benefit of the reader. This does not necessarily mean it is simple to write. - Have a good technical knowledge of the unit that is the subject of your writing. - Have a good understanding of the STE Writing Rules and its Dictionary. - Be able to identify which words you can use as technical names and technical verbs. - Be able to structure thoughts and ideas logically and understand your reader’s needs. No. Its purpose is to describe complex systems and complex tasks in a clear and simple form. This means that technicians with a limited knowledge of English can easily understand what they read and do the work correctly. Is STE just for non-native speakers of English? No. Although STE was created to help non-native speakers of English, it also improves communication among English mother tongue. Does STE eliminate the need for translation? Yes, if the readers have a basic knowledge of English. No, if they do not have that level. If translation is necessary, does STE help the translation process? Yes, STE can be a valuable support for technical translation. When STE was created, one of the primary objectives was to make translation easier. If the vocabulary, meanings of words, and the types of sentence constructions in a text are controlled, the variation between texts will be minimal. Thus, it is easier for translators or translation machines to translate text written in STE into the target language. Will STE change the meaning of technical texts? No. If correctly used, STE will not change the meaning of technical texts, because it requires a high standard of professionalism (both linguistic and technical) on the writer’s part. Can government employees use STE? Yes. They can use the principles of STE in documents for which a translation into a non-English language might be required. The discipline of STE would create better, shorter, more concise and more precise documentation files. The primary advantage would be the standardization of government documentation with the maximum benefits of the readers. No. STE was developed for technical documentation only. But the rules and a simpler vocabulary can help communication in meetings and presentations. Do readers need training for STE? No. STE is not a new language. It is a carefully structured version of English which removes confusing word usages and complex sentence structures. Readers with normal English skills will notice immediately that the words and sentences are less confusing or ambiguous with STE. It is not necessary to know STE rules to enjoy the reading benefits of STE. Can STE be used to teach English? No. STE is not an English course book. This specification will help the writer present complex information in an easy form. Writing clearly is a complex task and it is necessary to have a high level of fluency in English to write STE correctly. Can STE be applied to documents to all technical documents? Yes. Although STE was created to improve maintenance documentation, its principles can dramatically improve the reading quality of documentation in any industry.